Fearless Hopelessness | What am I doing here? Many NGOs working in international development are finding that their revenues are falling, there is increased competition for funds and people who are poor are at risk like never before because of food and water shortages, climate change, natural disasters, rising energy and input costs, refugee influx, population growth or migration. This can lead to new organisational pushes that focus on making staff redundant, redoubling fundraising and marketing efforts and a new emphasis on risk management to protect the organisations Brand. As management and boards seek to try to have more control of their destinies , organisations that pride themselves in bottom up development and field effectiveness can themselves become increasingly hierarchal, struggle with issues of transparency and focus on growth and internal efficiencies with lessening apparent concern for the quality of outcomes for people who are poor. International NGO’s generally have audacious visions such as “for every child, life in all its fullness”…….“A world in which every child attains the right to survival, protection, development and participation”……..”A just world without poverty, in which people can influence decisions which affect their lives, enjoy their rights, and assume their responsibilities as full citizens of a world in which all human beings are valued and treated equally”. Each vision statement has at its core, hope within the hopelessness of a vision that can never become true. Some management along with marketers and fundraisers may well try to hold a world view that all development problems are solvable and the right strategy, focus, steady growth and clever marketing the organisation will sustain itself indefinitely. I want to raise questions about what International Development NGOs really trying to sustain and why the promotion of hope and vision among each organisations staff is the most logical, effective and necessary approach to achieving each organisations Mission and Vision and sustainable future. And how an undue focus on size, the generation of funds and management of risks is in fact less likely to sustain the organisation in the long term than having fewer funds, more flexibility and focusing on which activities approaches and resources are most likely to achieve unsurpassed development outcomes. 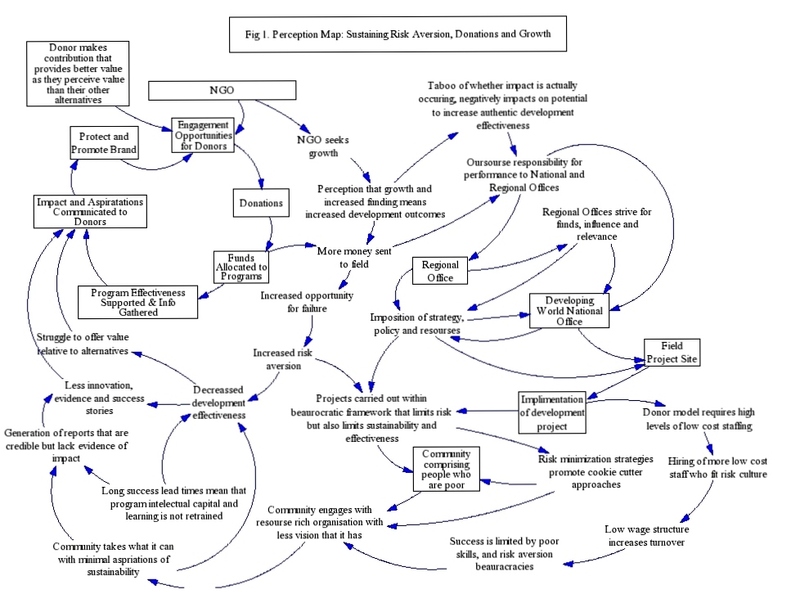 In the hybrid causal loop/perspectives map (Fig1), I have attempted to depict linkages for how more funds, an aversion to risk, staffing whose fit is more important than abilities and systems that place predictability over need, are likely to undermine everything that might sustain an NGO into the future. A reading of the diagram suggests that the key element to NGO organisational sustainability is going to depend on how effectively impact and aspirations are achieved in the field, as well as how this impact is communicated to donors. There is potentially a non-virtuous spiral that means more funds and more programming exposes the organisation to greater risk, posting threats to the Brand, causing more focus on risk minimisation actions, which leads to poorer development outcomes, which makes funds generation more diffulut, or at least risky, which leads in turn to more risk minimisation and a redoubling of efforts to raise more money. The impact of an organisation wide “taboo” on discussing the true quality of the development work relative to the aspirations of donors and developing communities. How organisational and staffing structures negatively impact on community development aspirations and how these lead to decreased development effectiveness and thus increased risk to the Brand of the NGO to its donor communities. So what is it a typical International Relief and Development NGO trying to sustain? A Vision Statement is a way of articulating the dreams and hopes for the people who comprise and support the organisation. The reason donors give their money to NGOs is in the hope that a difference will be made. Most donors will never meet the beneficiaries of their generosity but they give in the ‘hope’ that through their sacrifice, the lives of some people who are poor will be changed for the better, in sustainable ways, that their donation of itself, has made a real difference. Aid agencies have consistently found that donors are more inclined to give money to support relief efforts to a few people who are impoverished rather than tens of thousands. Apparently the larger numbers are overwhelming and donors lose the hope that their contribution can actually make a difference. Thus the donor perspective is most likely to be one where they are supporting the NGO to provide a solution to a poverty situation. From the perspective of an NGO, in this time of rising prices of food, fossil fuels and agricultural inputs, population pressures, environmental degradation, climate change, wars, famine, migrations, natural disasters and water issues, the larger perspective cannot be one of solutions but rather of a predicament or “wicked problem ”, where outcomes are better or worse rather than solved. In this context an NGO can logically only maintain hope and a vision for the future for some beneficiaries that is better rather than worse. In this context “a solution” is a hopeless aspiration. It would seem that while a donor may have some hope in specific solutions the collective hope needed by the NGO’s leadership would seem by necessity to be a different kind of hope, along the lines described by Czech playwright, essayist, poet, dissident and politician Vaclav Havel. Here Havel seems to be talking about how hope can still reside in hopelessness, as being something beyond the hope of results and instead the hope to do the right thing even if the challenge seems to be overwhelming. Thomas Merton, the late Christian mystic and writer also talks of hope, and the hope he seems to be referring to is not the hope from finding solutions rather than the hope that survives in doing what is right, regardless of the consequences. What both Merton and Havel seem to be pointing to is that strength, inspiration and action can all arise freely in spite of a seemingly hopeless situation and that as Merton says within the “truth of the work itself”. The “opposite” of hope is therefore not hopelessness but fear, as it is fear; fear of failure, fear of loss, fear of utter powerless that leads to despair; it is fear that saps the strength from hopes wings. Thus the question arises: What would it take for an organisation, as an entity, to hold a vision within hopelessness, to be working within an overwhelming predicament, free from fear and be supported by tens of thousands of donors most of whom believe the organisation is providing solutions? It would seem logical that International Relief and Development NGOs will not be able to survive indefinitely if there is a disparity between their vision and what donors believe they are supporting. Could it be that fear arising from the size of the predicament also has a role in over energetic fundraising, growth for growths sake, bureaucracy and risk management as substitute actions for work arising from “the belief in the work itself” that Merton speaks of? An organisation, of itself, cannot hold hope within hopelessness, organisations have systems, structures, policies, resources and so on. It is the people within the organisation who will or won’t carry the hope and vision of such an utterly outrageous proposition of “a just world without poverty” or “every child who is today in poverty will experience life in all its abundance”. It is paradoxical that NGO’s may ask donors to believe in an audacious vision and ask people in communities to increase their lots though self determination and belief in their own power to make a difference, and yet in their actions as organisations appear to be driven by fear thus sacrificing their authenticity with donors and communities alike. So to rephrase the sustainability question, what is it that the organisation needs to sustain in order to do its work and achieve the most it can with purpose, effectiveness and relevance into the future? I believe there is a strong case to suggest what will sustain Relief and Development NGOs into the future is the vision and hope of the people who make up the organisation and that the expression of this hope will lead to actions that improve the lives of people who are poor and offer opportunities for impact that are greater than the other alternatives available to donors. My hypothesis is that the leadership of these NGOs will need to convey each organisations vision in such a way as to realign the staffs worldviews with Donors and Communities who have more hope for change than is generally true within the NGO and its partners. To survive and maximise its potential for impacting on the lives of people who are poor, my belief is NGOs need to refocus their leadership towards seeking to sustain vision and hope in the midst of overwhelming challenges. For Development NGOs to sustain vision and hope in the midst of overwhelming challenges there will need to be the emergence of new and innovative approaches and new ways of reframing the “solution” orientation to one of “predicament”. The only Wicked Problem strategy intervention consistent with international (community) development theory is “Collaboration” (Roberts, 2000), to work with all stakeholders to find the best possible options for proceeding with development approaches that builds the hope and vision amongst donors, NGO staff and communities. And to be less engaged with providing solutions than we are with improving predicaments. With this orientation hope does exist that we can communicate in new ways with our donor community and that our authentic aspirations will drive change throughout the value chains that we are a part of, towards more meaningful engagement with our stakeholders and better quality outcomes that are based on comprehensive shared visions rather than parochial short term survival activities. This entry was posted in Stories From the Road and tagged Advice in International developement, Dilemmas and Wicked Problems, Immunity to change. Bookmark the permalink.